When I first arrived for work in the Allagash Wilderness Waterway- at the ripe old age of 19 years, I had the privilege of meeting some very interesting people. People that I didn’t realize would become Allagash legends. Milford and Dorothy (Dot) Kidney were two remarkable people that made their seasonal home at Lock Dam for 28 summers, between 1957 and 1985. I loved to stop and visit with Dot and Milford when I was up the lake working on campsites. They were a kind gentle couple that made you feel totally welcome at their home in the wilderness. A cup of coffee and a goodie were always offered whenever a ranger dropped in for a visit. On some of those cold windy days, a visit with the Kidneys was great opportunity to take a break and warm up. Back in those days my cooking abilities were lacking. Being single, I didn’t really take the time to make a nice meal for myself very often; I was usually too busy going fishing or exploring after work to cook a meal. One lunch that Dot offered me on more than one occasion, that I have never had anywhere else, was a warm bowl of canned peas smothered with canned milk and plenty of butter floating on top. It sure did hit the spot for a young culinary-challenged ranger. Milford was the dam keeper for the East Branch Improvement Company and Dot was a prolific freelance writer. They lived at Lock Dam in a one-room cabin not far from the shore of Chamberlain Lake. 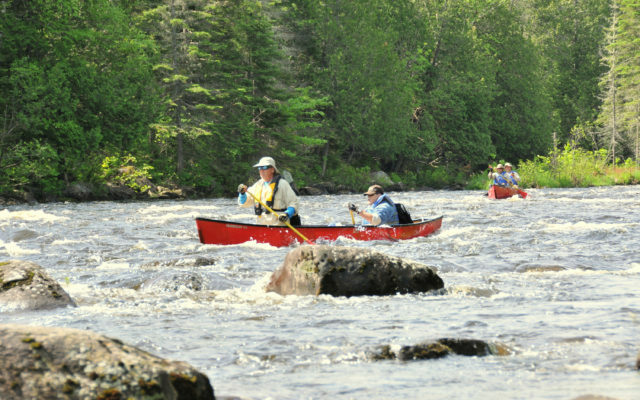 One of Milford’s duties was to open the outlet of the dam to provide additional water flow for canoeists paddling the famed Allagash canoe trip. They were also there to aid outdoor visitors to the area, often using the crank telephone and later two-way radio to call for help in emergencies. Milford’s favorite fishing hole was right below the dam. When the water was turned down at night it was pretty easy to catch a few trout for a meal — one of the perks of living in the Allagash. Dorothy Boone Kidney — “Dot” to those that knew her well — was a prolific writer. She wrote three books about their life in the wilderness at Lock Dam: “Away from It All,” “A Home In The Wilderness” and “Wilderness Journal.” These books are great stories about life in a one-room cabin at the north end of Chamberlain Lake — stories about encounters with bears, fishing expeditions to secret spring holes and interactions with guides, woodsmen, rangers and game wardens.